Welcome to the world's first home snowmaking weather tool. This powerful tool will let you see your past, present and future snowmaking information in detail. Display’s your live current snowmaking conditions including Temperature, Humidity, and Wet Bulb Temperature. 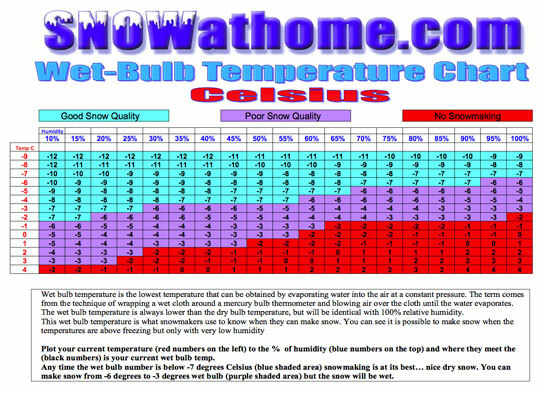 The snow quality gauge gives you what the current snow quality will be if the current conditions allow for snowmaking. On the right side of the quality gauge a snowflake symbol will appear if snowmaking is possible at this time. If snowmaking is not possible it will display how many degrees “too warm” it is for snowmaking. Your 5 day snowmaking forecast, is displayed across the bottom of this tab. Daily high and low temperatures are displayed. A snowflake will appear on the day snowmaking is possible. On each forecasted day that snowmaking is not possible it will display how many degrees “too warm” it is for snowmaking. 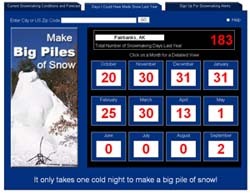 Displays the total number of days you could have made snow last year. This data is displayed in a one year view with the totals for each month. You can click on any month to get a detailed view displaying hi and low temperatures and the actual days you could have made snow within that month. 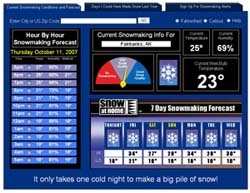 A snowflake is displayed on the days that snowmaking was possible. Don't want to miss any snowmaking opportunities? 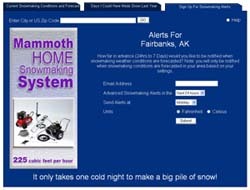 Sign up for SAH's™ exclusive email snowmaking alerts! You choose how much advance notice you receive (from 24 hours to 5 days) giving you plenty of time to prepare. This snowmaking weather tool gathers data from the nearest weather station to the location you entered into the data field. The actual weather at your location may vary. We highly recommend using a weather station with temperature and humidity readings at your site in combination with the weather charts below for the most accurate snowmaking information. When N/A is displayed on any result, this means the data is not available. The snow making charts below show the weather conditions needed to make snow. 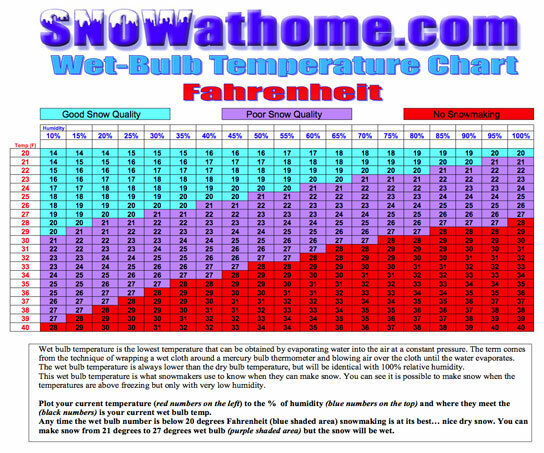 Click on either of the snow making weather charts to see full size PDF and save your own copy. Home | Our Products | FAQ’s | News | Weather Tools | Testimonials | Contact Us | Distributors All Contents © SNOWatHOME LLC, All rights reserved.